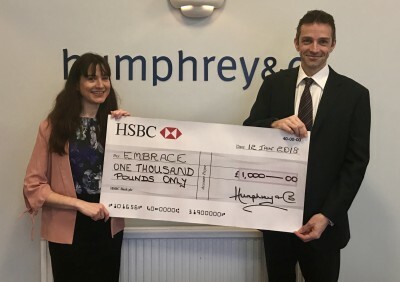 Our nominated charity for 2018 is Embrace and to mark the beginning of our sponsorship senior partner Anthony Smith presented a cheque for £1,000 to charity CEO Rebecca Whippy. This amount is donated to our nominated charity each year in place of sending Christmas cards to our clients and business colleagues. Embrace was formed in 2014 to support special needs and disabled children and their families. Their ethos is 'Because no child should feel alone'. Further details about Embrace and the charities we have supported in previous years can be found here.